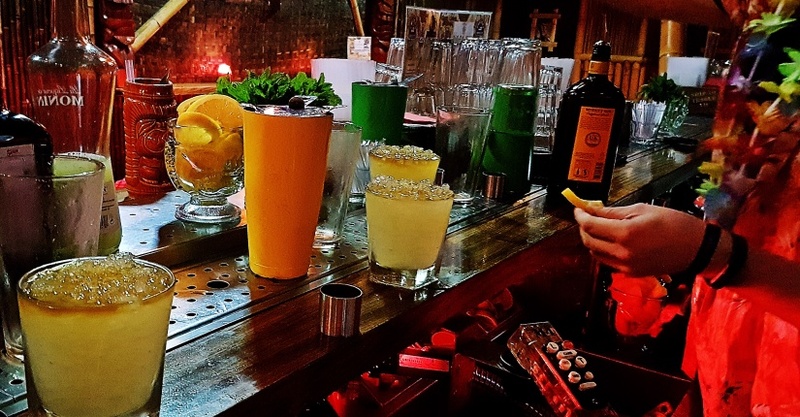 Leeds Loves Cocktails hit the town earlier this month for a week jam-packed with cocktail masterclasses, parties and discount nights. And naturally I went on holiday #planningfail. Luckily I got to experience some of the fun of it during the press launch I went to a few weeks before. And I also managed to cram in a visit to Tiki Hideaway before heading off to the Lake District. Tiki Hideaway always seems to be where I end up at the end of a night out. The chill vibes and great music has often been the perfect setting for drunken dancing with my friends. So this visit was actually the first time I got to see the bar through sober eyes. The bar is accessed through Call Lane Social, which was actually the first bar I went to in Leeds (not counting the few times I visited as a student). Walk through the bar and up the stairs, and you’ll think you’re just finding an extension to the dance floor downstairs, or perhaps the toilets. But actually, walk through that door and you’re transported to another place entirely. Tiki, as our host explained, is a concept that comes from Polynesian culture. It is the name of the first Man in Maori legend, and is also the name of the familiar wooden or stone humanoid carvings that are scattered about Tiki Hideaway. But Tiki, in general, means a sense of living life the way you want to – stepping away from the fast-paced Western 21st century vibe, into a more relaxed, take-it-easy culture. Tiki bars originated in America with Donn Beach and Trader Vic’s in the 1930’s. Think fire, bamboo, leis and rum – or better yet, don’t think at all, just get yourself down to Tiki Hideaway. The event I attended was the Mahiki Tiki Takeover. In case you haven’t heard of it (I hadn’t), Mahiki is one of the most famous Tiki nightclubs in the world, frequented by both royalty (Prince Harry and Prince William) and celebrity (Rihanna, Lady Gaga, Paris Hilton). While I waited for the Masterclass to begin, I got to enjoy some of the awesome live music being played – it sounded like Tiki twists on well known songs. Finally it was time to make some cocktails! We took our seats excitedly around the bar while the bartender began to explain the foundation of Tiki culture, and also some of the fundamentals of cocktail making. That’s it! And it’s so obvious when you look at the recipes for things like Whisky Sour, Mojito, and the cocktail we’d be whipping up – the Mai Tai! We were invited behind the bar and each handed a Boston shaker, then walked through the steps. First there was combining the top five ingredients in a cocktail shaker and shake shake shaking it. We were even given tips on how to shake our cocktails – glass part away from the customer! Next we poured it into a chilled glass filled with crushed ice. Our expert finally gave me a satisfactory explanation for having so much ice in your glass – it means the ice will stay colder, and melt more slowly. If you just put a cube or two in, it’ll melt quickly and dilute your drink! And finally we garnished with orange rind and a cherry, and a spring of mint! With that, our cocktail was complete, and we settled in to drink them. Now if you have been to Tiki Hideaway before, you’ll know the one thing that keeps us coming back like moths to a flame (literally). I’ve even been known to order one when not particularly in need of a drink, just so I get to watch them make it. And our bartender was kind enough to make one for us. Our expert explained that it was important to use a concave fruit to house the spirit, otherwise it would just run off. A lime half is his fruit of choice, though he also recommended half a passionfruit. And then, the secret ingredient that gives that well known Tiki sight – can you guess it? I lingered a little longer to chat to people over my Mai Tai, but had to call it an early night due to wedding dress shopping for my bestie the next day. But I left with a deeper appreciation of tiki culture, deeper knowledge of how to make awesome cocktails, and excitement for my next tipsy visit to Tiki Hideaway. I was invited to the Mahiki Tiki Takeover free of charge, but all opinions of amazing cocktails food are my own. Here’s my full disclaimer.